Born in Japan but now residing in the Northeastern US, pianist Masako triumphs on her debut self-titled album, which was recorded at Imaginary Road Studios, where Will Ackerman, Tom Eaton, and the artist co-produced it (Eaton also did the spectacular job of engineering, mixing and mastering). Ackerman has once again unearthed an exceptional talent (does this guy have some kind of musical divining rod?). Masako's music draws accurate comparisons to the glory days of Ackerman's Windham Hill label (as well as competitor Narada). Her sensitivity, control of nuance and shading, and her quasi-minimalist style (not as minimal as George Winston, but certainly in the same ballpark at times) won me over on the first track, the solo piano number, Glastenbury, VT (named for a ghost town in the Green Mountains – and no, I wasn't aware that Vermont had ghost towns either). That first track clearly shows that Masako has an uncommon approach, as her touch is frequently featherlight on the keys, even when peppering this gentle, somewhat melancholic tune with a flurry of notes. It's this softer-is-better approach that I admired so much on this CD. There is obviously a place for power and passion in piano music, but there is also a place for delicate shading, and a way of hitting the piano keys with subtlety and grace, allowing the music itself to yield the drama, not the music's volume. Besides the four solo songs on the album, Masako is joined by a few well-known guest artists: cellist Eugene Friesen, violinist Charlie Bisharat, bassist Tony Levin, wind synthesist Premik, percussionist Jeff Haynes, vocalist Noah Wilding, and English horn player Jill Haley, (Ackerman also sits in on one track playing Hopi drum). With all of this stellar talent surrounding her, one might think Masako could get lost in the mix (not literally, since Tim Eaton is a pro's pro in that regard), but it's always clear this is her album, her music, and her chance to shine, which she does. Masako's liner notes detail the source/inspiration of the twelve tracks, several of which are drawn from geographic places, such as Secret Path to Point Reyes (Part 1 and Part 2) and Ottauquechee River. Spring Snow, which features Friesen and Haynes, has a lovely rolling sensation to it (as do a few pieces on the CD), and the cascading notes no doubt are meant to convey the falling snow of the title. The liveliness of the tune is sprightly but, as noted earlier, Masako's restraint with her playing means that the faster tempo doesn't detract from the beauty of the music. "Secret Path to Point Reyes (Part 1)" has an autumnal feel to it (and, in fact, more than once while listening to this CD, I was reminded of Jim Chappell's under-appreciated Acadia release, which has the same feel at times). Premik's wind synthesizer (an instrument that controls a synthesizer and is played as a wind instrument) brings a lovely element to the song, a gentle floating melody that hovers in the air over Masako's melancholic piano. Part 2 of the song (on which Masako plays solo) is more cheerful in mood, lively in tempo but still restrained so as to not derail the overall mood of the album. "Ottauquechee River" (with Bisharat on violin, Haynes on percussion, Levin on bass, and vocalist Wilding) paints a musical picture of the rushing waters of the river on a sunny day, laughing as it rushes along its path, winding its way through the countryside. Bisharat's violin playing is the perfect complement to Masako's flights across the keyboard. The fastest tempo piece on the CD, it is nonetheless refreshingly devoid of overt drama. One of my favorite pieces is A Tale of Lonely Otter, featuring piano, cello, bass, and percussion. The opening and concluding passages are melancholic solo piano "bookends" to the middle of the tune which becomes a subdued playful ode the titular creature's gentle rambunctiousness. Remembrance (Part 1) is fittingly somber but not truly sad, graced by noteworthy, albeit brief, contributions from Friesen and Levin, while "Part 2" offers something more optimistic and uptempo, propelled not just by Masako's piano but also Haynes' percussion and Bisharat's violin. 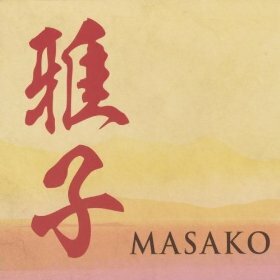 The remaining three tracks serve as an underscoring of Masako's abundant talent, especially the evocative warmth and soft simplicity of the sad concluding number, Forgotten Moments on which Masako is accompanied by the supremely talented woodwind artist, Jill Haley, here playing English horn. With the dizzying number of pianists that Will Ackerman has produced over the last five years or so, it would be difficult to single any of them out as being a cut above the others, but if I was pressed to do so, I would have to put Masako on that short list. Her debut release displays the self-assuredness and control of nuance and shading that many an established artist would love to possess. The future is indeed bright for this artist and I hope she continues to play in the style that makes this CD such a delight.